MasonicInfo Note: Much of this page derives from a work titled "LIBER CAPRICORNUS - THE SYMBOLISM OF THE GOAT" by Eugene W. Plawiuk as presented to Norwood Lodge #90, AF&AM, G.R.A. on September 3, 1991 and found among the files of 'Hiram's Chamber', likely the first widely-used Masonic Bulletin Boards and shepherded for many years by Preston Burner to whom Masonry on-line owes a huge debt of gratitude. 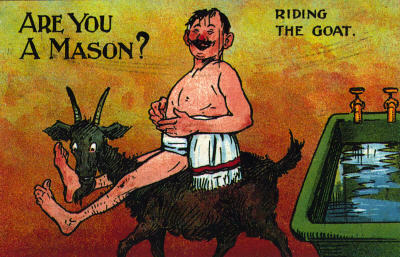 Whether it's as a recipient (i.e., in preparation for receiving the first degree of Freemasonry) or as a perpetrator, rarely does one fail to hear mention of "The Goat". It was - unfortunately - sometimes the first warning heard prior to entering the lodge as an Apprentice and - regretfully - it's a tool of anti-Masons in order to cast aspersions. The origin of this ostensibly humorous initiatory jest is unclear and there doesn't seem to be anyone who can cite its beginning. It might have come from the practical joker and Freemason but that's speculation at best. There are no references to it in the major Masonic reference works although some anti-Masonic works have used it as a source of derision for years. 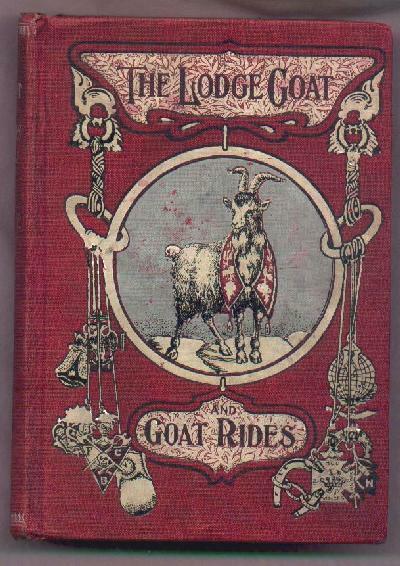 Further, it was common to joke about such a thing with initiation into other fraternal organizations as well, particularly groups like the Odd Fellows and the Knights of Pythias (you can see from the K of P Emblem in the lower left corner of the book at the bottom of this page - and the goat pictured is wearing what appears to be an Odd Fellows' collar!). Because of the lack of references, it would be easy to dismiss our Goat as a simple joke, one which survived from the concept of fraternity hazing, once so popular. Thus dismissed, though, gives anti-Masons an ostensible charge with which to claim the demonic nature of Freemasonry. The Goat dates back to the very earliest primordial memories of Man and has played a great role in the myths and legends of all religions and cultures of Western Europe. We learn of The Goat through the ancient science of Astrology first developed by the Chaldeans, or as they are commonly known; Babylonians. Brother Plawiuk says, "The Goat symbolizes male fertility, and is known, to even those who peruse the daily astrology columns of the local newspaper, as representing the astrological sign of Capricorn; Dec. 22 to January 22. Capricorn is a combination of both a Goat and and a fish. According to J.E. Cirlot in his Dictionary of Symbols, this dual aspect refers to 'the dual tendencies of life towards the abyss (or water)' or chaos of the beginning of time, and 'the heights of mountains' or order and malkuth (the earth) as symbolized by the goat aspect." In fact the very same Babylonians who gave us this symbol of Capricorn and the science of Astrology were the first Temple builders, and the goat for them symbolized the essence of the Temple or Lodge. An animal usually found climbing in the mountains. Thus from the first ziggurats to the Temple of Solomon even to later Churches the Goat was seen as symbol of Man striving to reach God through his building of Temples that represented mountains. Since in all religions Gods abode is symbolized by mountains. The androgynous symbolism of the horn of plenty is typical of the symbolism of the goat in general. While the Greek Goat Gods Pan and Dionysius were male, we look at the goat as an animal in masculine terms while it is both male and female. The identification of the the male goat in by his beard, since both genders have horns. The phrase " by my beard, or " he pulled my beard " as well as the style of beard called a 'goatee' all relate to the goat. Ironically the horns on the head of Michalangelo's statue of Moses are also Goat horns, symbolizing not the devil but the power of nature and natures God; Fiat Lux. For in the Bible it states that Moses was beheld by his people as having two rays of Light springing forth from his head. "Hark! My Beloved! here he comes, bounding over the mountains, leaping over the hills. My beloved is like a gazelle or a young wild goat." "My beloved is mine and I am his; he delights in the lilies. While the day is cool and shadows are dispersing, turn my beloved, and show yourself a gazelle or a young wild goat on the hills where cinnamon grows." " How beautiful you are my dearest, how beautiful! Your eyes behind your veil are like doves, your hair like a flock of goats streaming down Mount Gilead." The Song of Songs (Which is Solomon's). Herein as well in the Old Testament we find the beautiful love poem which views the goat as symbolizing nature, and fertility as it did in prechristian times. In the Song of Songs both lovers refer to each other as goats. As to be expected since the lovers in this poem are a shepherd and shepherdess herding goats!!! And we have the symbolism of the goats in relationship to sacred mountains or temples. It is enough to mention that this song is known as Solomons who plays such an important role in Freemasonry. J.E.CIRLOT: A DICTIONARY OF SYMBOLS. PHILOSOPHICAL LIBRARY NY 1971. MALCOLM C. DUNCAN: DUNCANS RITUAL OF MASONRY. DAVID MACKAY CO.
MANLY P. HALL: ed, THE DIONYSIAN MYSTERIES AND MASONRY. PHILOSOPHICAL PUB. HOUSE 1936.